The DC comics direct-to-video animated movies are literally the bomb. They beat out every live-action attempt on the DC characters with ease. They even out-due many of the not-so-good Marvel films. "Wonder Woman" back in 2009 was great, "Green Lantern's First Flight" was better than anything Martin Campbell and Ryan Reynolds did with the character, "Batman: Year One" was epic bliss, etc. I could honestly go on and on about their success. Why DC studios doesn't just get the people behind these wonderful movies into the director's chair for their live-action films is a mystery. 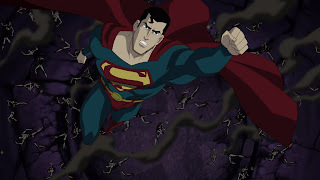 "Superman: Unbound" is good little superhero movie, a great way to warm-up to "Man of Steel" coming out next month. If you have any interest in DC, Superman, or superheroes in general, it would be a good idea to check this movie out. The film features voice by Matt Bomer, John Noble, Stana Katic, Molly Quinn and Stephen Root. Everybody has good work on display in this movie. One thing in particular that I automatically took a liking to was just how well the story was written. Even though this story is a cartoon and it is intended for kids, the ideas of the story are very adult. When the movie begins, Superman and Supergirl are in a little bit of an argument. Superman does not want Supergirl to rush into fights for world safety. Supergirl thinks Superman doesn't remember anything from planet Krypton, thinking he is writing off his heritage completely. With Lois Lane, things are even worse. Lois wants to be seen doing normal things with Clarke Kent, not Superman, Clark Kent. She wants a normal dating life with him, but he is hesitant to fulfill her needs because of what could happen if his enemies find out Clark Kent and Superman are one in the same. These are big ideas to fill a cartoon with, and I love that the movie didn't shy away from everyday dilemmas people have in relationships and family ties. Superman's problems are put to the test with the arrival of a giant, skull-shaped ship. This ship is powered by Brainiac. Brainiac has a plan to learn everything he can about every planet and civilization in the universe. Which does in part by stealing cities from various planets, and I don't mean in any metaphoric sense. I mean he literally picks the cities right out of the ground. Supergirl recounts a time when Brainiac stole her hometown back at Krypton before it was destroyed. Superman and Supergirl must learn to work together before Metropolis is stolen. The film features typical animation, but it isn't anything super stylish or sleek. The action sequences are cool for the most part, but feel very Saturday morning-ish. Most of the ideas tackled in the film can appeal to people of all ages, but the dialogue is geared toward younger audiences. If you can look past those small nitpicks, there is quite a bit of fun to be had with "Superman: Unbound." The only other big problem I have is that 75 minutes, the story closes just as things are getting really fun and cool. But that is common for films like this, the gearing towards younger audiences is the main goal of these films. They are short but sweet little stories about iconic superheroes. It is a fun ride throughout and even a bit challenging at time. The best part is that it is for all ages.